This lovely basilica is a stop on the pilgrimage route of Santiago de Compostela. Although this church has a bloody past, today it is a lovely and lively part of Toulouse, well worth a visit. It is one of many interesting religious buildings in Toulouse. Located less than half a mile from the Capitole, the church and its lovely octagonal bell tower form a major landmark. Made of a combination of red brick and stone (with the upper parts all brick due to the high price of stone), the building is graceful and striking. Although the west facade is rather severe, the sides are elegant and the church has a number of ornate doorways. 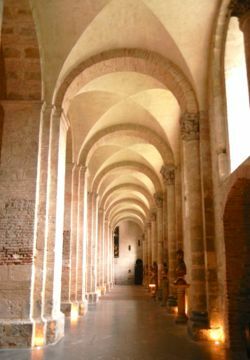 The interior is noted for its vaulted nave and it massive size, as befits a pilgrimage church. St-Sernin is the biggest Romanesque church in the world that is still standing. The octagonal bell tower reflects both Romanesque and Gothic architecture. Saint-Saturnin (Saint-Sernin is Occitan, the local language) was the 3rd century bishop of Toulouse and a martyred saint. According to legend, he died after being dragged through the streets by a sacrificial bull, down the nearby Rue du Taur and Church of Notre-Dame du Taur (Taur means bull). The first church, a small basilica, was built on the site in the 5th century, but Saint-Sernin was a popular saint and soon a larger edifice was needed. The present basilica was built in the 11th and 12th centuries and restored in the 19th century by Viollet-le-Duc. In addition to being one of the most beautiful Romanesque churches, it also houses a significant number of relics. The Basilica of Saint-Sernin is a stop on the famous Path of Saint James, or Santiago de Compostela. From France there were four paths leading across the Pyrénées to Spain. The Via Tolosana, or Toulouse Route, began in Arles and passed through Toulouse. The paths were listed as UNESCO World Heritage sites in 1998. 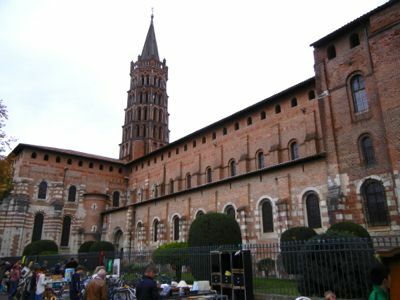 Saint-Sernin is one of many lovely churches and religious buildings in Toulouse. 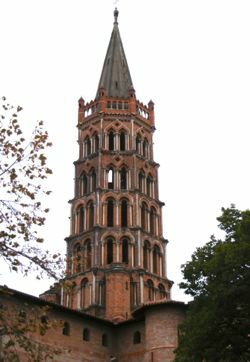 Above, The beautiful octagonal bell tower of St-Sernin. 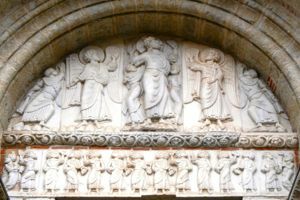 Below, Detail of a doorway, St-Sernin, Toulouse.